Psalms 24:6(KJV); This is the generation of them that seek him, that seek thy face, O Jacob. Selah. 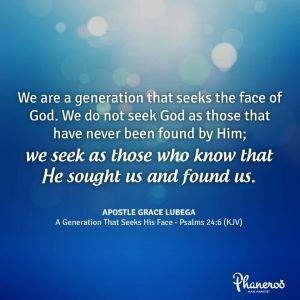 We are a generation that seeks the face of God. We do not seek God as those that have never been found by Him; we seek as those who know that He sought for us and found us. He says, knock and the door shall be opened (Matthew 7:7). We are knocking that the door be opened but we do not forget that the door is Christ. He is the access to everything that we need. We are not seeking God because we have not seen Him; we seek God because we have seen Him. It is the glory we behold that sends us back to the closet because nothing on the earth can match it. It is the treasures of wisdom that we receive in our spirits that cause us to tarry in His presence. It is the answers that we find to the questions we never asked that keep us in His presence. Child of God, we are a generation that prays but you must have this understanding of how we seek Him. Seek Him with a vision of the FINISHED WORK. Seek Him with a vision of the end of the very things we seek. We are a generation that seeks the face of God. We do not seek God as those that have never been found by Him; we seek as those who know that He sought us and found us. PRAYER: My Lord, I thank You for this great wisdom. I seek Your face in this understanding. I know that I am found. I go to Your presence as one responding to an invitation. You have not called Jacob to seek You in vain. I bask in the endless treasures and pleasures of abiding in You. To the glory of Your name. Amen.